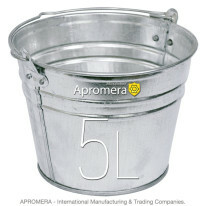 These buckets are absolutely essential in everyday life. 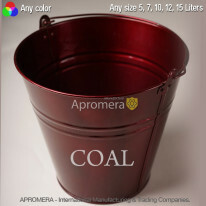 The products differ in volume, capacity and color. These containers have enhanced fire resistant and waterproof qualities, they can be used for industrial, economic, engineering etc. purposes . The models differ in strength and impact resistance. A special coating is safe for storing food. 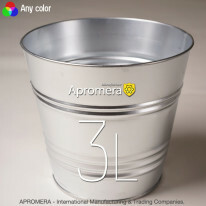 This container is made of high-quality steel sheet coated with two layers of heatproof material. 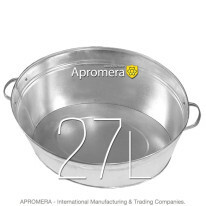 It is strong glass-ceramic coating applied in two or three layers, with their consistent roasting at a temperature of 800-850 ° C. Due to the same index of metal thermal expansion the coating does not peel off while heating meals and provides reliable protection from dangerous acids present in certain foods, as well as corrosion. User-friendly design. Models have a large variety of forms. Practicality. 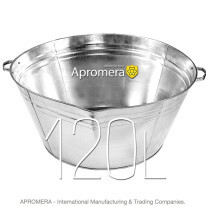 Due to the durable material these products can be used at high temperatures – up to 100 degrees, they do not oxidize or rust. Durability. Products have a long service life – at least 10 years (if the metal surface is not exposed to continuous mechanical stress). 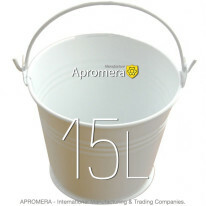 Enamel Buckets are very popular among gardeners and designers in London / Britain, UK.